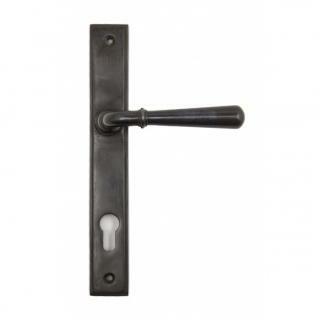 The newbury set is part of the period range of sprung lever handles. The simple and slender design fits well into many different property types. 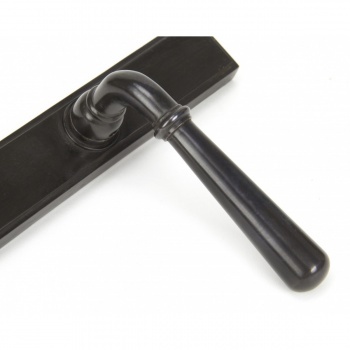 Our weighty newbury lever handle range is forged from solid bronze which emphasises the high quality materials and manufacturing techniques used. A perfect design choice to use throughout your property with many other matching products available. 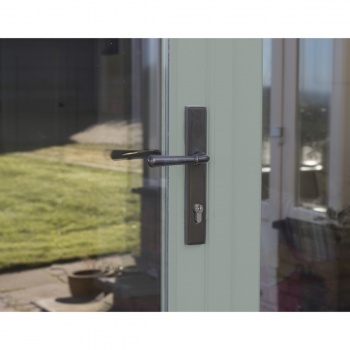 This finish is manufactured from solid unlacquered bronze containing a minimum of 85% copper. Our aged bronze finish is matt and rich due to the finishing process we use to age the metal, this process initially darkens the material, however the finish will gradually oxidize over time revealing the warmer copper undertones. This finish has been salt tested to 480 hours. This handle has a strong double spring incorporated into the stylish boss design to give both functionality & elegance. Lever handle for external doors where multi-point locking is required. Set includes an internal and external lever espag lock handle. 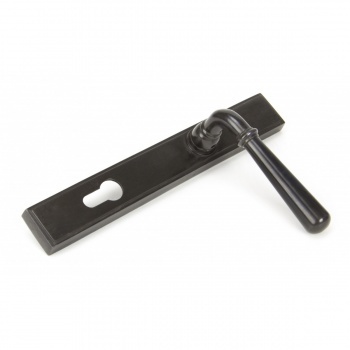 Can be used with a multi-point lock or french door kit in conjunction with a euro cylinder. Supplied with matching SS bolt through fixings.